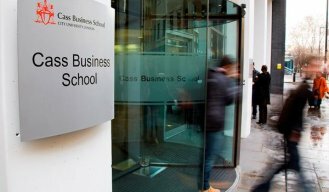 MBAs at City University London’s Cass Business School average about seven years of experience and 30 years of age. They have scored a 648 on the GMAT. The school also offers an executive MBA (five years’ experience, average age 34), a modular executive MBA, and a Dubai executive MBA. The Cass full-time MBA is a 12-month program starting in September that is taught around the school’s Core General Management Programme. It is designed to develop core knowledge and skills in business and management, giving students a “base skill set, ” says Benjamin Crooks, digital marketing assistant. Core modules cover Strategy and Organizations, The Financial Environment, Creating Management Advancement, and Knowledge and Policy. Elective modules cover the following areas: Consulting and Strategy, Entrepreneurship and Innovation, Finance, General Management, and Marketing. MBAs run two projects alongside the core and elective modules: one Strategy Project in the first half of the program, and a Business Mastery Project in the latter half. The full-time MBA is ranked 37th globally by the Financial Times, up from 45th in 2015. Eighty-eight percent of Cass’s 2016 graduating class found employment three months after graduation. They found work in 18 different sectors, with the majority going into Consulting and Financial Services. Cass MBAs also may select from the electives offered in the EMBA program, which runs evenings and weekends. The Cass EMBA, like the Dubai EBA, is 24 months. In 2013 it was ranked 35th by FT, fifth in the UK, and 14th in Europe. International EMBA electives include an International Study Tour in China, Strategic Marketing in Action in Las Vegas, and Business Strategies in India, as well as the core of Entrepreneurship in Silicon Valley and a UAE International Study tour.